Yahh to a nice long weekend. Any plans for the 4th of July? I'll probably catch some of the firework action down by Hoboken with my husband. I'm excited we're going to have some good weather this weekend. Yahh for stripes and yahh for a sale! 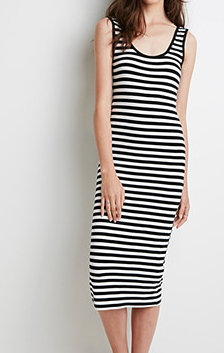 Of course this stripped maxi dress dress caught my eye at Forever21. It was on sale for $10 I just couldn't resist. It's perfect and fresh for the summer. 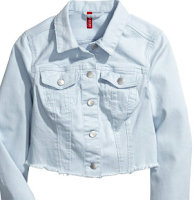 I paired it with this cropped denim jacket to edgy it up a bit. This was also on sale for $17 at H&M. There was a major sale going on and it's still going on, items for 70% off. Don't you just love a good sale?! Hope you guys have a fun and safe 4th of July weekend! Love the dress, love the look! And for $10, what a deal! Love this outfit, this whole look and all of the photos! !